View Poll Results: Who were Milan's top 3 players for the 2010/2011 season? MILANELLO - All the pink to complete all the technical staff has reached the sports center where Rossoneri Milanello to 13.00 lunch is provided for the first of the season 2010-2011. Posted by Peter Mazzara and Antonio Vitiello. In drafting Marvel Stephen and Matthew Calcagni. At 13:45 Great enthusiasm of fans for Alexandre Pato, by far the most acclaimed by the Rossoneri supporters. Hours 13:40 All players left the sports center. Ambrosini, AC Milan captain, stopped to sign autographs, creating great enthusiasm from the fans. Many cameras and great excitement by many supporters. Hours 13:20 am two trucks of policemen entered the sports center of Milanello: something you can move. 13:10 hours The President Silvio Berlusconi should land at 15 to Milanello in time for the conference by Massimiliano Allegri scheduled for 15:30, more than the coach could speak Tuscan Adriano Galliani and captain Massimo Ambrosini. 14:36 hours: Berlusconi in Milanello to do a refresh with some guests, pending a conference scheduled for 15:30. The team has already dined. 14:30 pm: The Curva Sud sings the chorus: "We want a President, we want a President." Waving also the following banners: "Minister: your card is failure, Article 9 is unconstitutional," "Do not subscribe to Sky subscribers with Milan." 14:25 hours: Curva Sud: before the gates of Milanello smoke signals prevent the reading of the banners. 14:15 hours: Landed President Silvio Berlusconi, rain of boos from the fans Rossoneri. Choirs and insults against the Rossoneri boss. 14:12 hours: The new purchase Papastathopoulos salutes the fans. 14:10 hours: It is rumored the presence of Minister Maroni. 14:05 Hours: Part the classical chorus: "Who does not jump is Inter. The fans also sing backing vocals for Clarence Seedorf. Meanwhile begin to reach the famous journalists, including Order and Ruiu. Hours 13:50 Besieged by many fans of the machine Filippo Galli. Last edited by Sod-Lod; 20-07-2010 at 14:04.
its seems milan got a new bus.. NICE ONE berluca just visited it and was pretty impressed. 15:10 hours: the time is approaching press conference Massimiliano Allegri, that our editors will be live, LIVE, with continuous updates. Hour 17: 56: After the revolutions of the field, the group met in the middle of the field for the first years, amongst the general enthusiasm of the fans, who sing songs for Pato (classic "Ole, ole, ole, Patooo, Patooo ") and Ronaldinho. Hour 17: 50: And 'started training. New look for the Rossoneri: yellow shirt and green away from home for the goalkeepers, second and third split (respectively white and black) for the rest of the group. First chorus for the new purchase Sokratis Papastathopoulos. 17:40 hours: The club has just fallen on the field and greeted the fans, returning the affection received. Finally, in order of appearance, Ronaldinho: The Brazilian was greeted by a standing ovation. Now the group is escorted to the center of the field the first speech of the new coach Massimiliano Allegri. 17:30: The fans have flocked to the edges of the central field of the leg to watch the first team under the guidance of coach Allegri. Impatient, the Rossoneri supporters clamoring for the arrival of the players. You start to hear some hisses. The aim of every respectable club is to follow a project, to build on something and ultimately achieve success. If there is a team in Serie A which has simply given up on this very basic concept of football it is Milan where ambition, one can claim, has arguably been missing for years at Milanello. The Rossoneri tifosi have held a civil demonstration in order to protest with the way the club has been run in recent times. The fans simply want to start the campaign with some much-needed hope. However, the Diavolo response doesn’t give them much to hope for. Silvio Berlusconi keeps reminding the supporters of how great Milan used to be. While Adriano Galliani underlines that this is an era of sacrifice, of financial crisis, and that the club is trying to ensure stability in the long term. Reasonable thinking there but the truth is that while the Diavolo has been sleeping, Inter have become the best club in Italy and also managed to succeed in Europe. The Nerazzurri overtook Milan’s record in Scudetti while the Rossoneri watched their empire crumble. Milan are in an even worse state than Roma and Juventus. The Giallorossi have no money, but they are making the most of their resources. The Bianconeri fell in disgrace but at least they are trying to start some sort of project. Milan are doing nothing. Berlusconi and Galliani should look at themselves as the ones to blame for this. OK, the club doesn’t have the financial strength that it once clearly had but their plan making and deals in the transfer market have been disastrous. Their countless mistakes have cost Milan dearly. One of the main problems for the Diavolo are the wages handed to half retired players. As a result their squad isn’t getting any younger and looks weaker by the season. In the meantime, Berlusconi keeps promising a big capture. Is that a season ticket sales ploy? Regardless of what he is thinking, a big buy, be that Zlatan Ibrahimovic or whoever, won’t be enough to help Milan. Instead of continually falling backwards, Berlusconi and Galliani should screw their heads back on and opt for a change. To start with they could get rid of Ronaldinho and use the money for his wages to strengthen their formation. 19:10 hours and 'just finished training for the new Milan. It concludes, therefore, the first day of work for boys Massimiliano Allegri. 18:40 hours continued training for the Rossoneri to the orders of Mr. Allegri. After the match, the team has taken over the years. Also noteworthy is the first goal of the season, is by Marco Borriello. 18:15 Everything is ready for the first practice match in midfield. 18:10 The team also some young people like Merkel, Novinic, Strasser, Beretta and Verdi. Be noted, however, the absence of Amantino Mancini Milan, therefore, did not confirm the Brazilian for next season. 18:05 hours begin exercises with the ball: rallies in mid-field and exchange on the fly. 18:00 Still running from one side of the field. Soon the ball will come on stage for the first kick of the new season. 1st goal of the 72 I predict Borrigol to score this year. MILANELLO - The first photographs of the players training are available to view. Click here for the photographs from Milanello. 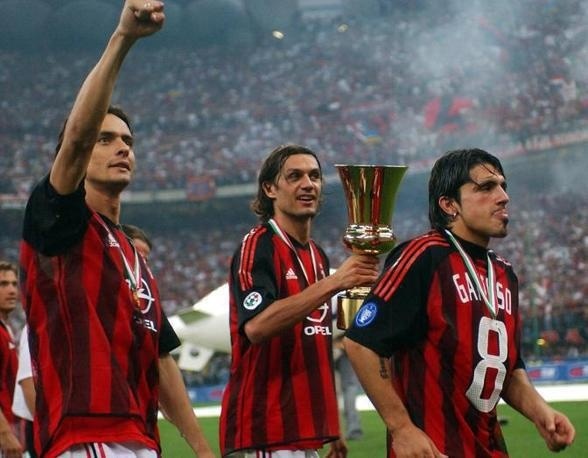 And 'officially started today, the 2010-2011 season for AC Milan. In front of about 2,500 supporters at Milanello, Mr. Allegri drove his first meeting with Milan coach on the field outside. MILANELLO - July 20, 2010: Work begins officially on the new weblog Milan Massimiliano Allegri. Exciting day at the sports center Rossoneri Milanello where players have arrived around 10:00 this morning. Absent only the Rossoneri have been busy with their national teams in South African World. The group also contains some of the young Spring: Merkel, Novinic, Strasser, Beretta and Verdi. After having supported some individual test in the gym, the team found itself at around 13:00 for dinner. At about 14:15 the president Silvio Berlusconi has landed by helicopter on one of the fields inside the sports center Carnoustie to welcome the new Rossoneri Massimiliano Allegri and all the Rossoneri. At 16:00, the Conference Hall hosted the press conference of President Silvio Berlusconi, who presented Mr. Allegri and the three new signings AC Milan for the season 2010-2011. At 17:30 or so, after the president's speech to the team, the Rossoneri went on the field outside the sports center to support the first training session of the season. Mr. Allegri spoke with the players in midfield for a few minutes and then begin the real work. The team began the session supported by the choirs of about 2,500 supporters. The first part of training saw the Rossoneri engaged in heating. For the first fifteen minutes, the players have worked dry: run, stretch and follow stretching. Then the heating is continued using the ball for another fifteen minutes. Following Mr. Allegri continued training session with an exercise aimed at holding the ball, while goalkeepers have worked separately with the new trainer Mark Landucci. Then the Rossoneri have engaged in a series of eleven against eleven practice match with the help of little doors. The training is then concluded with a practice match against eleven eleven-field reduced by the goals which ended 1-0 in favor of the players in white jersey. The first goal of the season was made by Marco Borriello. The sitting ended at about 19:10 with an energizing jog on the perimeter of the external field. Tomorrow Milan will support a double session of work: the morning workout is scheduled at 9:30, that afternoon at 18:00 on the external field, visible to fans. Last edited by Sod-Lod; 20-07-2010 at 22:15. MILANELLO - Milan will have a double session tomorrow: The morning workout is scheduled for 9.30, the afternoon at 18.00 on the outside and it is open to fans. The second day of pre-season training at Milanello saw the team go through an athletic work-out in the morning which lasted two and half hours. The squad will have a break before returning in the afternoon. MILANELLO - The second day of pre-season training started at 9.30 at Milanello. Once the players got out on to the tartan pitch the squad went through a vigorous warm-up session. After fifteen minutes, coach Allegri split the players into two groups, with one heading to the gym and the other to the woods and the sand-pit for strength-building and resistence exercises. The session ended at midday and the team will be back at 18.00 for the second session of the day. Last edited by Sod-Lod; 21-07-2010 at 11:26. I think Yepes will look good in our 1st kit. The red and black seems to suit him as it's intimidating like him. Last edited by dev1L; 21-07-2010 at 21:56. MILAN - The team started training at 9.30 on the tartan pitch at Milanello where they went through a series of warm-up exercises before coach Allegri took the players to the gym. Some of the players played volley-ball with the coaches. The next session will be at 17.30. Maybe they all want to be like Suarez?